I’m happy to report that this year’s crop of fall-grown broccoli is looking very, very good! Yes, I’m actually welcoming in the month of December by harvesting an impressive crop of large heads of nutritious broccoli fresh from the fall vegetable garden. This autumn season was ideal for growing terrific broccoli. There were warm days, cool nights, and plenty of rainfall to encourage the plants rapid growth. If you’re accustomed to growing broccoli strictly as a spring crop, next year give it a try in the fall also. You may discover that it grows even better in your garden as a fall vegetable crop. Broccoli is very frost tolerant and loves to grow in cooler weather such as during the spring and fall months. It not only grows extremely well during autumn, but I also think that it is better tasting when grown under cooler weather conditions. Your biggest challenge to growing broccoli during the fall may be in finding transplants to set out at the proper time for your area. If you can’t locate transplants at your local greenhouse during late summer the only alternative is to sow seeds indoors in early summer to raise your own broccoli transplants. This year I started some seedlings indoors at the start of August and purchased others from a garden center and planted them out into the garden during late August and early September. The broccoli transplants were spaced about eighteen inches apart in each direction and they filled in the raised beds nicely with just the right amount of growing room. With the relatively mild fall that we’ve been enjoying here in Zone 6 the broccoli plants have had plenty of time to mature and form huge heads of fresh green broccoli. The only insect pest that was in evidence this late in the season were a few cabbage worms that chewed through the leaves but didn’t venture anywhere near the broccoli florets. 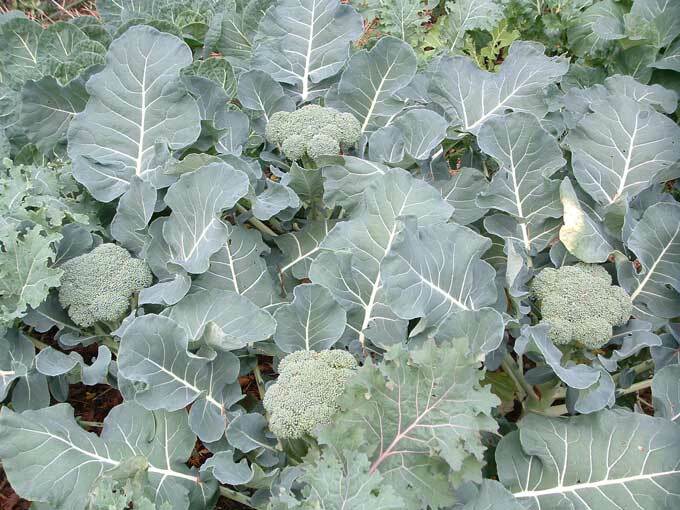 The plants and broccoli buds grow slower during autumn but that’s actually an advantage when it comes time to harvest the maturing heads. Where spring grown broccoli florets have to be watched closely and harvested rather quickly while in their prime in order to avoid over mature or blossoming buds, fall grown broccoli is much more forgiving. 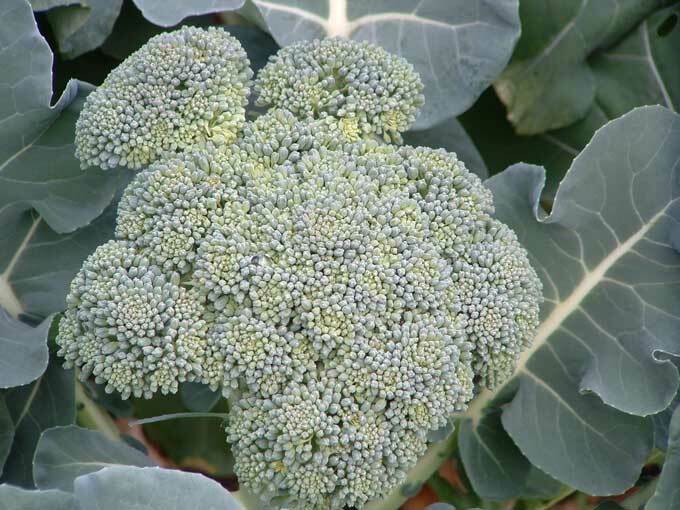 In fact, fall broccoli florets can be left on the plants for extended periods even after they reach mature sizes without much worry of the buds opening suddenly or of any loss in flavor or quality. The florets will remain tight and closed until you are ready to harvest and use them in the kitchen. On the down side, once you’ve harvested your initial crop of fall-grown broccoli that’s the end of the story. There’s little chance of fall broccoli developing side shoots and producing additional florets after harvesting the main shoot like you sometimes get with spring grown broccoli plants. I have never considered growing my own broccoli but I love it! I do plan to learn how to grow more of my own veggies this year! Great blog. Thanks for having such a helpful site! I am hesitant to grow broccoli because I’m afraid it will end up full of aphids. Sometimes when I buy organic broccoli it has aphids and other little bugs. Are these only a warm weather problem? Do you spray at all? I’m working on expanding my cold weather crops so thanks for writing about these. I grow at least 36 broccoli plants every year. I learned MANY years ago the organic way to deter the cabbage looper moth is by planting tall Marigolds amongst them. By tall I mean the 2-3 foot varieties. “Crackerjack” is a good one. So I LITERALLY plant 1-2 plants right up against the young broccoli transplant so they grow up together. This really works. For aphid control, I do the soap and water spray when it becomes necessary. I have grown Broccoli for many years in the fall. I look forward to them every year. I always enjoy many side shoots after the main head is harvested. I live in south Texas so perhaps the warmer temps have something to do with it. I love your site. I couldn’t learn how to garden without it. Thanks for the great effort. You’re very welcome Luke, thanks for stopping by and commenting! I live in the Texas Hill Country between San Antonio and Austin. I got a very late start on my fall garden and didn’t get my Broccoli seeds into the ground until early October. They grew very slowly even though we had a very wet fall. In early January I started getting small heads but they were very mild and tender. We had several nights into the upper teens with no problem but I covered them the one night we got a really hard frost about 10’F. I continued to get smaller side heads until the middle of March when I pulled them to make room for spring planting. I use BT to organically control worms but have never had a problem with aphids. Thanks for the info! Can fall crops be planted in between or under summer veggies, like tomatoes? I planted small store bought broccoli plants about 30 days ago, I live in Houston, TX, and the plants are growing tall but not flowering or producing a head of broccoli. What can I do to produce a head? Hi Brandy, I would keep the plants watered and fertilized as needed and just give them time to mature. Broccoli is pretty reliable when it comes to producing buds but they do prefer cooler temps and fall or spring growing conditions. THIS IS MY FIRST YEAR AT BROCCOLI, IT IS GROWING FAST, IT GOT FLOWERS AT TOP IS IT TOO FAR GONE? i live in south africa on the north coast (kwa-zulu natal). we have very wet winters and sweltering humid summers. we hydorponic, since our soil is sandy and very poor. i just had my first crop of broccoli (at the end of autumn). i planted from seed. they grew very slowly and once the heads formed – about a cup size, they made flowers very quickly. any suggestions ? Did you all know that the huge leaves on a broccoli plant are edible? You can saute them or cook them the same way you make collard greens. I am from Iran Vdrmntqh want to live in this country a warm, dry autumn Bkarm broccoli and place in the autumn of my life is cold and dry water course for farmers to do please help me thank you. I’ve wanted to get tips on planting a little broccoli.